Emory swimmer Andrew Wilson stunned the swimming world at the 2015 USA Swimming National Championships. After taking a year off from his studies to train, he will compete in the Olympic trials in both events. Photo courtesy Emory Athletics. Maddie Locus, an Emory PhD student in math who was a star swimmer at the University of Georgia, will compete in the 50 freestyle in the Olympic trials. Photo courtesy Locus. Emory swimmer Christian Baker, a rising senior majoring in linguistics and the economics of law, will compete in the Olympic trials in the 400 freestyle. Photo courtesy Emory Athletics. Oliver Smith, a rising junior majoring in biology and member of Emory's swim team, will compete in his first Olympic trial in the 50 freestyle. Photo courtesy Emory Athletics. After a breakout performance at last year's national championships, Andrew Wilson will compete for a spot on Team USA in Rio de Janeiro. Joining him at the Olympic trials will be Emory teammates Christian Baker and Oliver Smith, as well as PhD student Maddie Locus. Andrew Wilson is one of four Emory students who will compete at the 2016 Olympic swim trials — a record number of qualifying students for Emory. In 2012, Claire Pavlak and Miller Douglas were the first Emory swimmers in the program’s history to compete in the trials. Working on her PhD in mathematics with plans to become a research professor, Locus is a multi-time NCAA All-American freestyle sprinter who is ranked among the top eight U.S. swimmers in the 50 freestyle going into the Olympic trials. As an undergraduate National Merit Scholar and a star swimmer at the University of Georgia, she helped her team to two national championships. Today, she’s on the U.S. National Team — in 2014 she placed third in the 50 freestyle at nationals — and has represented the U.S. at the Pan-Pacific Championships in Australia. This summer Locus balances training with Swim Atlanta at the Georgia Institute of Technology, studying for doctoral qualifying exams in analysis and algebra, and writing her PhD with the guidance of math professor Ken Ono. 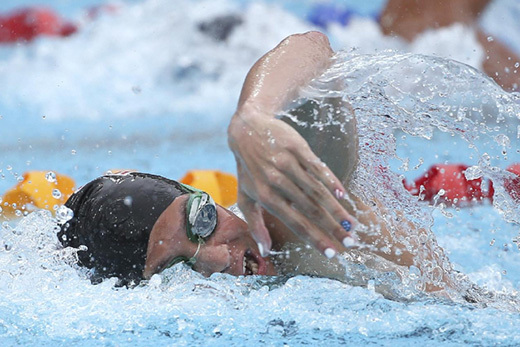 A native of Sugarland, Texas, Locus will make her second appearance at the Olympic trials; her first trip was in 2012. A rising senior majoring in linguistics and the economics of law, Baker earned a team-best six All-American certificates in the 500 freestyle, 200 freestyle, 1650 freestyle, 800 freestyle relay and the 200 and 400 medley relays, helping the Emory men’s swimming and diving team to a third-place finish at the 2016 NCAA Division III championships. While participating in a summer internship, Baker made time this month to qualify for his first shot at the Olympic trials in the 400 freestyle. A native of Farragut, Tennessee, he is the brother of former Emory swimmer Hayden Baker. 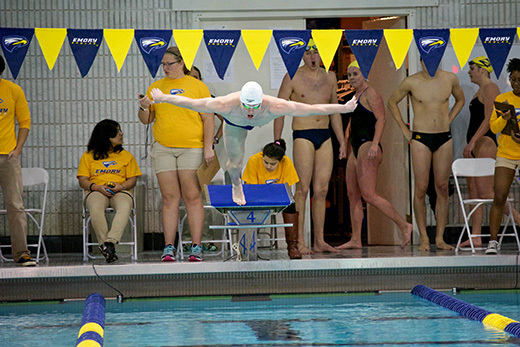 A rising junior majoring in biology, Smith has come a long way in Emory's swim program. In two years, he’s gone from posting times barely within Emory’s range to earning a NCAA Division III national championship in the 50 freestyle (with a school record time), and helping earn national titles in the 200 and 400 freestyle relays. During summer training, he’s been trimming his times. A native of Milan, Michigan, Smith will compete in his first Olympic trial in the 50 freestyle. Andrew Wilson will be the first to tell you that he wasn’t what would be considered a top recruit for the Emory men’s swimming and diving program. He was many other things, yes — nice kid, great student, earnest athlete. Coach Jon Howell could see that from the start. 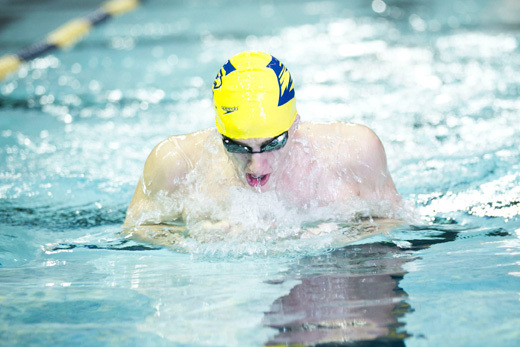 As a high school junior, Wilson was among an eager wave of prep athletes to express an interest in joining Emory’s award-winning swim program. Many were solid athletes who were simply posting times “a little outside our range,” Howell acknowledges. And yet, Howell liked Wilson, drawn in by a certain quality that he sensed more than he saw in their brief encounters. Call it a gut feeling. So he encouraged the young swimmer, gave him some target times to shoot for during his last year of high school. And so he proved it. Within months, Wilson’s times were accelerating. So when two swimmers Howell had been recruiting that year decided to go to other schools, he gave the earnest kid with the qualities that intrigued him a second look. Howell took a chance, gambling on a swimmer who knew how to set goals and chase them down, who sought balance between the pool and the classroom. A swimmer who simply believed in the power of the possible. And has it ever paid off. With only days to go before the 2016 Olympic swim trials — to be held June 26-July 3 in Omaha, Nebraska — the 22-year-old Emory senior is among the nation’s top-ranked swimmers in the 100-meter breaststroke, recording the fastest time in a U.S. pool in 2016, and ranks sixth in the 200. The top two swimmers in each event will qualify to swim for the U.S. Olympic Team in the 2016 Rio de Janeiro Olympics. In fact, Wilson’s time of 59.69 in the 100-meter breaststroke clocked at the U.S. Nationals last year officially makes him the 6th fastest American of all time in the event. It’s not a stretch to say that Wilson’s breathtaking ascent has set the nation’s swimming community on its ear. His sub-minute 100-meter performance at the 2015 Phillips 66 USA Swimming National Championship last August earned him the title of “breakout breaststroke star of the Nationals” in Swimming World magazine, which noted his transformation from a Division III swimmer to an Olympic hopeful in less than five years. After winning the national championship in the 100-meter breaststroke and placing third in the 200-meter breaststroke, he secured a spot on this year's USA Swimming National Team, with Howell named to the prestigious roster of national team coaches. An article on Wilson in the Washington Post last month claims that he “is on the verge of doing something that would defy more than 40 years of swimming history.” Should he make the final cut later this month, “it is believed he would become the first Division III swimmer to make the U.S. Olympic team since the NCAA split off into divisions in 1973,” the article states. In many ways, it’s a Cinderella story that comes as a surprise to almost everyone except Wilson, notes Coach Howell. And while Howell has worked with many athletes who are committed to hard work, he’s watched Wilson take that to the next level, fueled primarily by his optimism “and a sense of gratitude,” he says. For Wilson, part of that comes with striking a balance between his sport and his studies. “Swimming is not everything to him,” Howell notes. “He carries a 3.96 GPA as a double major in physics and applied math — an achiever in everything he does. 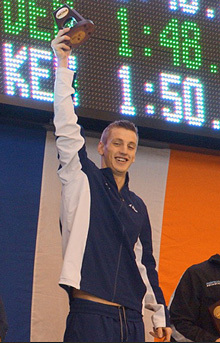 Andrew Wilson celebrates after winning the NCAA Division III Championship for the 200 individual medley. Photo courtesy Emory Athletics. With a goal of making the U.S. Olympic team, Wilson made the decision to take a year off from his studies at Emory to prepare for this summer’s trials. For the past academic year, he’s been training with Longhorn Aquatics at the University of Texas at Austin, one of the nation’s top NCAA Division I programs. He plans to return to Emory this fall to complete studies for his final year of NCAA eligibility at Emory. Challenging practices pushed his body, but for Wilson, something was missing. Wilson tried auditing a math class in Texas, but didn’t find it engaging. That’s where Emory professor Ken Ono entered the picture. Ono, Asa Griggs Professor of Mathematics, has known Wilson since first appeared in his classroom three years ago — he still remembers the swimmer earning a perfect score on the final exam. Based upon his academic talent, he was invited into the mathematics honors program, where Ono has been helping him with number theory research for his upcoming senior thesis. So Ono offered to work with Wilson from afar — tutoring him in upper-level mathematics to keep his brain busy outside the pool. And it worked. By using math to help with mental conditioning, his athletic performance improved. 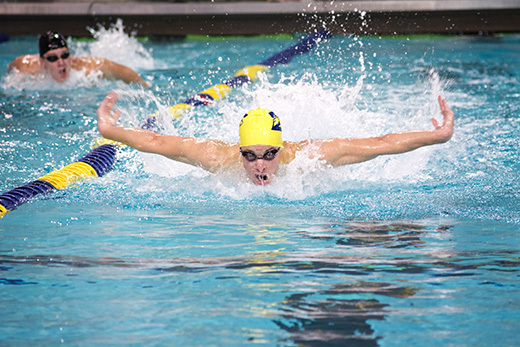 By some measures, Wilson didn’t consider himself a serious swimmer until he came to Emory. From playing at the neighborhood pool in Bethesda, Maryland, Wilson advanced to summer league swimming, then swimming for Phillips Academy, a high school boarding school in Andover, Massachusetts, that required participation in a sport each term. Wilson tried something different every semester — water polo in the fall, swim in the winter, lacrosse in the spring. But Wilson likes setting goals. His first year, he wanted to make the NCAA nationals and score at the meet. He came in fourth in the 100 breaststroke and seventh in the 200. By his sophomore year, he was on medley relays that won at the Division III NCAA finals. “My goals progressed as my swimming progressed,” he acknowledges. Although the idea of swimming in the Olympics had been a distant childhood dream, seeing his older sister, Jenny — who swam for Northwestern University — qualify for the 2012 Olympic trials in the breaststroke put things into perspective. Wilson set new goals. This month, he’s seeing them unfold before his eyes.